I love both Russian and French art, particularly decorative pieces and jewels. In future blogs, I’ll tell you more about these countries and their political alliance which lasted centuries. In fact, these historic stories is what led me to create tours of the jewelry capitals of St. Petersburg and Paris. I want you to experience first-hand the finest artistic achievements and treasures in their original settings. I was inspired to write this specific post when I saw the painting to the far left of the French enameller Eugène Feuillâtre in front of his kiln (especially having seen a similar image of Nikolai Petrov of Russia). Both were unparalleled masters of the enamel craft and they worked during the same time period – one in Paris and the other in St. Petersburg. Petrov was chief enameller for Fabergé in the imperial Russian capital from 1895-1917 and played a major role in establishing that storied firm’s international fame. 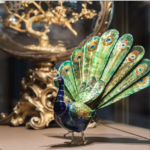 Fabergé is best known for its guilloché enamelled creations, most notably in the imperial eggs. Feuillâtre was born in Dunkirk in 1870 and died in Paris in 1916. Apprenticed in the studio of Etienne Tourette in 1883 he went on to specialize in cloisonné and plique-a-jour enamel and lead the enamelling workshop of Rene Lalique from 1890-1897. Unlike Petrov, Feuillâtre became well known in his day by exhibiting in Paris Salons and international shows. He also worked for Louis Comfort Tiffany. In addition to jewelry, he made silver enamelled mounts for glassware and established his own hallmark in 1898 when he exhibited independently at the Paris. 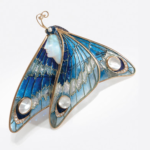 Like Fouquet and Lalique, he excelled in the Art Nouveau enamel while incorporating lesser-valued materials, such as opals, ivory cornelian and topazes. He was well established by 1900. Back in St. Petersburg, Nikolai learned the craft as a boy, along with his brother Dimitri, from his enameller father Alexander Petrov. It’s not clear when he joined Fabergé, but two workshops are mentioned in the records: one in the same building as chief Fabergé designer Frantz Birbaum and the other in the basement of the flagship Fabergé shop at 24 Bolshaia Morskaia. Although none of his work is signed, Petrov was a master of the guilloché enamelling technique which made Fabergé so famous. He apparently had a quick temper, but was known to work day and night on challenging creations. After the Bolshevik Revolution, he worked for the mint producing Red Army badges, but died early of malnutrition and stress. Petrov labored without recognition it seems, unlike Fabergé workmasters such as Perchin and Wigström who used initial hallmarks on their works. Some call Petrov the greatest enameller of Russia. For more on Feuillâtre and other French jewelers check out Jean Jacques Richard’s blog Bijoux et Pierres Precieuses and for more on Petrov, see Fabergé: A Comprehensive Reference Book by Tatiana F. Fabergé, Eric-Alain Kohler and Valentin V. Skurlov, pg. 238. P.S. Make sure to take a look at our Art & Treasures Tours for 2019 & 2020. We add new tours often, so check back frequently!